When you want to thank your flower girl from the bottom of your heart, here is a perfect gift that says "thank you" in a heartfelt and personal way. The cute "Mouse Bride & Mouse Groom" design adds charm to this unique gift. Everyone knows that the bride and the flower girl are the "stars" in any wedding. If you are searching for a unique keepsake for a special little flower girl, look no further. 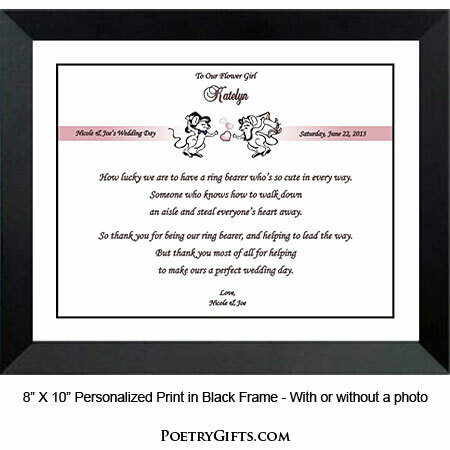 This EXCLUSIVE personalized poem thanking her for helping to make your wedding day perfect is the answer. 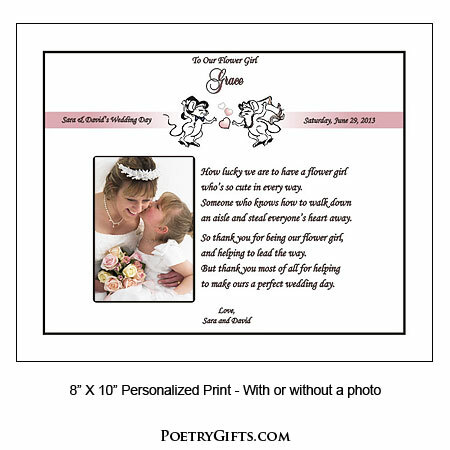 We personalize this heartfelt poem with your flowergirl's name, the bride and groom's names, your wedding date, and a closing message from you. And, how adorable is the Mouse Bride and Mouse Groom design? 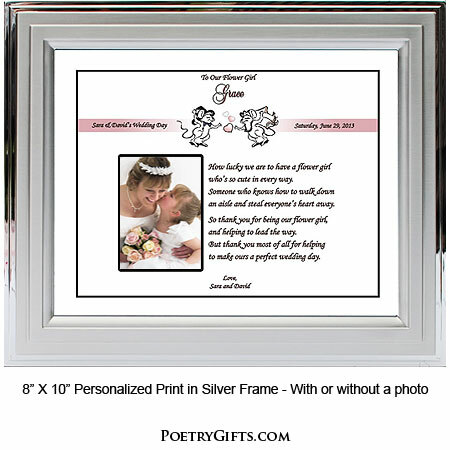 When you insert a picture of you and your flower girl, this personalized Flower Girl Poetry Gift becomes a treasured keepsake. 3. Closing Phrase and Your Name(s) (as seen after poem) - (Examples: We Love You, Justin & Katie; xoxo Brandon & Laura; etc.)" 4. Phrase and Wedding Date as seen in pink band towards top of design - (Examples: Jessica & William's Wedding Day - Saturday, October 5th; Justin & Kara's Wedding Day - Saturday, June 15)"